ISTE Standard 1 defines the roles of leader, Standard 2 describes how the leader works, and ISTE Standard 3, “Digital Age Learning Environments” describes what a visitor would see when they enter the classroom of a leader, the effect on the school, and the output of work. Before I move forward, I would like to state that I prefer to work with the students that tend to have the lowest scores because that is how I was raised. My mother was an intervention teacher and my dad always coached kids that never seemed to do well in school, yet we always knew they were bright. My goal with kids is to show that every student can be successful and technology provides yet another avenue to demonstrate this. Throughout my career I have been an advocate of the “gentle-breeze approach.” My contracted career is young and I’ve moved around within a district based on promotions so I haven’t been at one site for more than a year. I tend to have the naysayers lineup immediately and I admit it is demotivating. Teachers can be harsh when they criticize your work. My teaching has made teachers believers in a technology project-based education primarily because it made life easier for teachers and they saw students succeed. The initial reactions I had received from teachers included “oh, so kids play on the computers now?” or “well that’s easy, just put them on the computers.” I remember one comment at the time stung pretty well when a teacher I respect said “well isn’t that cute.” During this initial time I kept on the path and within weeks teachers became warm to the idea of what was going on in my classroom. By midyear one of the teachers above had her younger student coming to my class on a daily basis. Another teacher (one who was always receptive) on multiple occasions had her daughter skip classes at a high school 30 minutes away to come and sit through my middle school classes and be assigned to one of my techies. At the end of the year teachers began asking me to help them implement projects. The greatest moment was when my students presented at a county showcase on an equal footing with students in engineering programs. It made a strong statement when my learners presented to different superintendents and principals and went on to document the experience and win a student film festival. In the video below a group of 9th graders helped roll-out technology programs to 5th graders down in Mission Viejo. 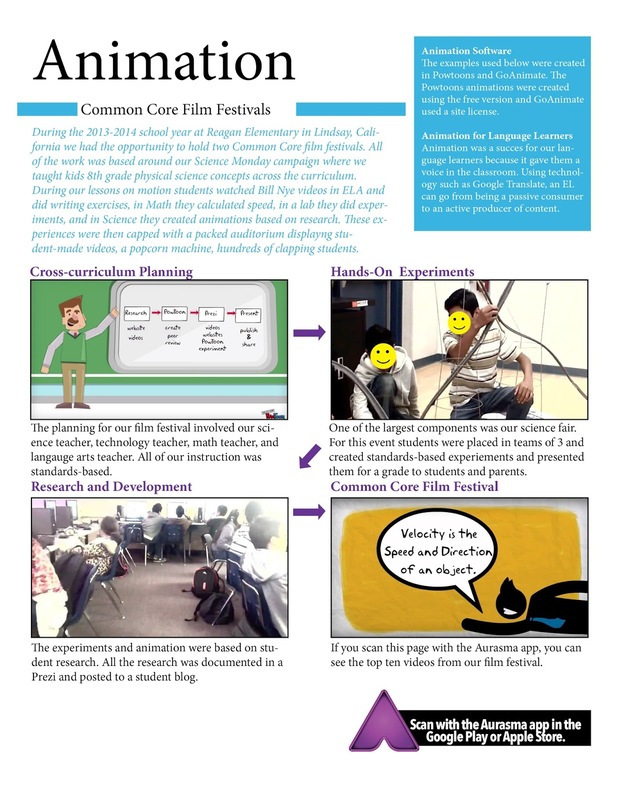 Using Facetime, students tutored the younger students in math, GoAnimate, Prezi, and SketchUp. These same students also went and presented with me in a session at the Kern CUE conference on a 21st century classroom. At one presentation a teacher teared-up and said she knew her kids could also produce like this if they had the chance. 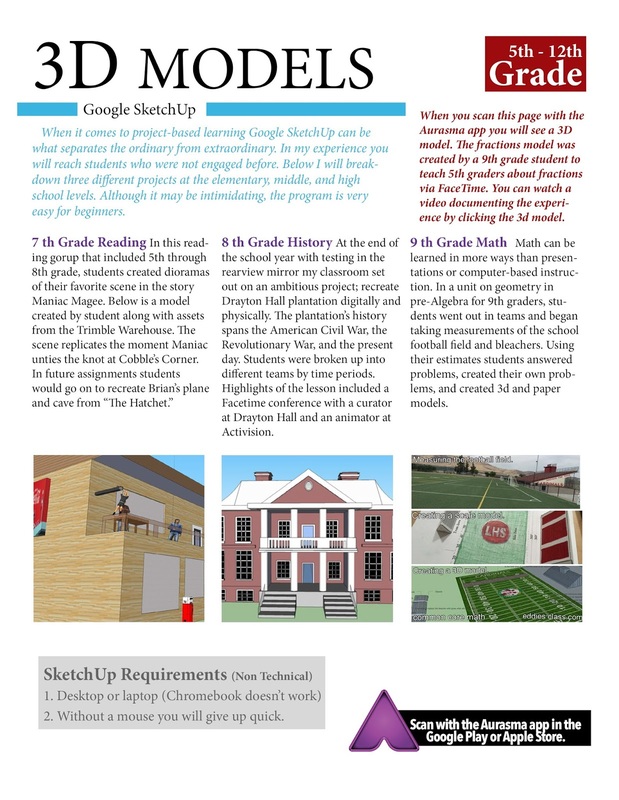 Below are newsletter pages demonstrating more digital age learning environments I have been blessed with experiencing. My hope is that by documenting and sharing them, more teachers will have the resources available to give students a project-based education.